Digital imaging has made major inroads in crime-scene units and forensic departments all over the world. Digital photography has many advantages over traditional photography: savings on material costs, film development, storage space and time. Results are available instantaneously and, if not satisfactory, a new image can be taken immediately. However, there is one downside: the resolution of certain images. In most cases, like shots of a single fingerprint or overviews of a crime scene, the resolution is sufficient for the intended use. A problem is encountered when a shoeprint needs to be photographed. Enlargement of this kind of trace may result in dpi (dots per inch) resolution that is low and unsuitable for making comparisons. Using a 5.2-megapixel camera to photograph a Gellifter sized 5.2 x 14.4 inch (13 x 36 cm) will produce an image with a resolution of 180 dpi. In comparison: a 155-megapixel camera would be needed to capture the same image with a resolution of 1000 dpi. With the GLSCAN (Gellifter scanner), traces obtained by Gellifters are recorded in a high resolution. 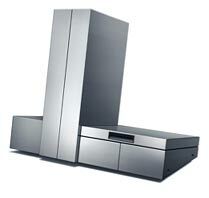 The GLSCAN is the first system to be specially designed for digital recording of traces lifted with black Gellifters. Its operation is of such simplicity that even 'non-professional photographers' will obtain excellent results. The GLSCAN captures images with a resolution of approximately, but not less, than 1000 dpi. This high resolution makes it possible to view (on screen) or print greatly enlarged details. On a 21" monitor, the image is enlarged about 11 times when viewed at 100%. The GLSCAN is equipped with three individual light sources that provide for an even illumination of the complete surface of the Gellifter. Two of these sources are specially for the scanning of black Gellifters. They produce light of high intensity and enable the capture of even the weakest traces. The Gellifter is kept perfectly flat on a vacuum table while scanning is in progress to avoid unwanted reflections giving rise to hotspots in the image. Distortion of an image, the so-called fish-eye effect, is limited to the absolute minimum with the GLSCAN. A cleverly placed high-quality lens ensures an image that is distortion-free along both the x and y axes. In contrast to traditional photography, in which a lot of effort is spent finding the correct illumination and exposure time, developing film, et cetera, the GLSCAN is very efficient. 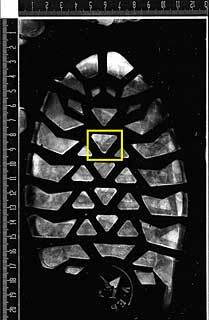 A shoeprint is scanned in less than 2.5 minutes. The image is automatically saved on the hard disk of the connected computer or shown in a preview window. In the preview window the scan can be judged, it can be zoomed in on details, mirrored, inverted, and a selected area can be chosen before deciding to save it to the hard disk. If an image processing program is installed, the scanned image will be opened directly in that program for evaluation and adjustment/fine-tuning. The GLSCAN is operated by a PC running Windows XP. The command window on the screen is well-organized and simple to operate allowing choice/selection of scan size, illumination, whether vacuum is used during scanning, and the camera sensitivity (gain). Case and item number can be entered for use in the file name of the image (important for archiving). Additional data can be entered, such as place and date/time of obtaining the evidence, which is stored together with the image file (EXIF information in the TIFF format). The images captured by the GLSCAN are automatically saved on the hard disk of the connected computer. With entry of a new case number, a new folder (subdirectory) is made with the case number as name. Each image name combines the case and item numbers with "_ref" and the "tif" extension, i.e. casenumber_itemnumber_ref.tif. 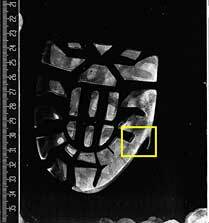 This 'raw' image is stored as a "read-only" file and can be viewed as the negative in traditional photography. The GLSCAN is delivered with an up-to-date computer (Windows XP) and a 30" monitor, GLSCAN software, a vacuum pump (mounted in a sound-absorbing, mechanically ventilated cabinet - dimensions [L x W x H] 17 x 16 x 31 inch) and two vacuum tables of 5.2 and 7.2 inch width (maximum scan length 14.4 inch). Each vacuum table is fitted with a ruler on a long and a short side. Image processing software is not included. Shoeprint on black gelatin lifter, scanned with GLScan. 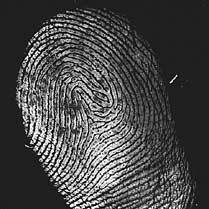 Untreated fingerprint on black gellifter, scanned with the GLScan. GLSCAN brochure (5.5 MB PDF). The GLScan user group has a forum on Yahoo.